the November 1962 total of $1,764.6 million. able :r, a c' *-iroity basis. an increase in exports of corn, from $45.8 to $73.3 million. Exports of wheat, however, fell from $123.9 to $97.6 million. modities included in this economic class. 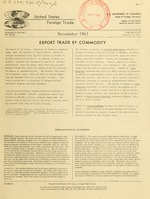 statement, see foreword in I foreign Commerce and N..-Ration of the United States. For sale by the Bureau of the Census, Washington, D.C 20233.Price 101 per copy. Hides and skins, raw, except furs....................value..
individuals and private agencies.................... value..
Meat and meat products ........................... 1,000 lb.. Vegetable oils, fats and waxes, refined ...........1,000 lb..
by individuals .and private agencies.................value.. Naval Stores, gums and resins................................. value.. Vegetable oils and fats, crude.............................1,000 lb..
Iron and steel pi't. :, sheets and strips...................1,000 lb..
Coal-tar and other cyclic chemical products................... value..
Plastics and resin materials.............................. 1,000 lb..
Industrial chemicals, exclusive of Special Category Type 16...value..
Nitrogenous chemical fertilizer materials..................1,000 lb..
All other semimanufactures, exel. Special Category Type 16....value..
Truck, bus, and automobile tires (casings), new ...........thousands..
Glass and products ........................................... value..
Radi@ and television apparatus................................ value..
Other electrical machinery and apparatus...................... value..
parts, exclusive of Special Category Type 16 ................. value..
tools and parts ............................................. value.. Textile, sewing and shoe machinery............................ value..
Other industrial machinery and parts.......................... value..
totals for "Other cotton manufactures" rather than "Cotton cloth" in the issues of this report for periods prior to September 1963.